A very early independent software house mostly known for educational software. 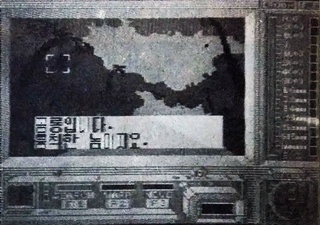 In 1987, the team left its mark by being the first Korean company ever to deliver a home entertainment game for the Japanese market, or at least claming as such. 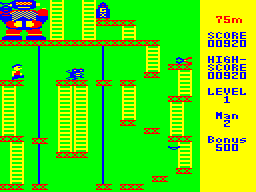 The company existed at least until 1991, but made no further impact on the gaming world. Now this PC-6001 port is looking familiar. 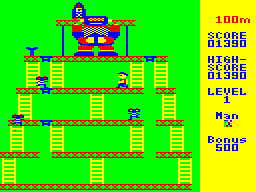 Spy Panic takes Donkey Kong and replaces the ape with a robot who keeps hostage a bomb in place of a lady. Behind this makeup the result is actually more faithful to the original than many ports on comparable systems. 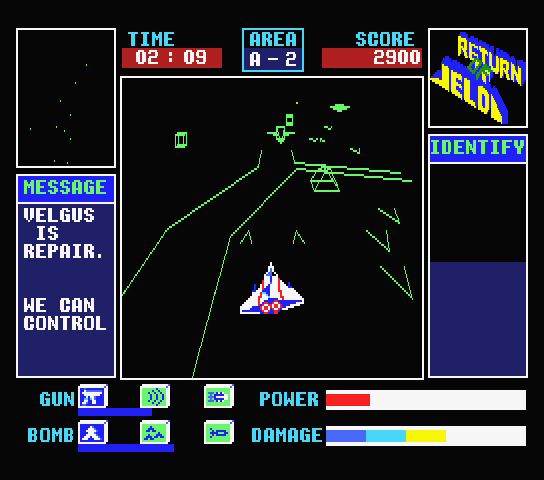 All four stages are included, and the controls are very tight for an early 80's home computer game. Only the hammers are missing. The flames hunting "Mario" are replaced with mini robots, who are much more numerous and aggressive here, making this version very difficult. 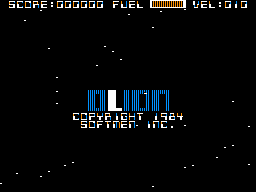 With Olion (funny Engrish typo right in the title) Softmen brought 3D graphics on the SPC-1000. Of course it's very primitive, and most shapes are barely recognizable as what they're supposed to depict, especially on still images. The game runs at a decent speed, though, and is once again surprisingly playable, although the controls are a bit all over the keyboard. Like many SPC-1000 games, Olion originated on the Japanese PC-6001. However, the port contains full credits with Korean names, suggesting either the PC-6001 ports were no mere conversions but reprogrammed for the SPC-1000, or some of the Korean bootleggers were more impudent than even assumed before. 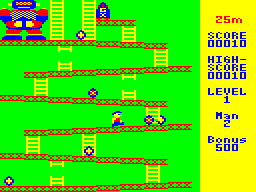 The game also credits one Tarry Miller for the idea it is based on, on another spot he's referred to as L.Miller. 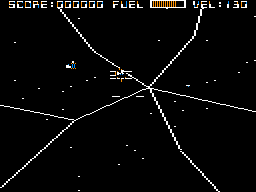 Given that his ideas where used for a first person space shooter, it's likely he was some science fiction writer. The music is taken from Star Wars, and the game owes some more to Lucas' epos, so maybe there's some connection with this Miller and Star Wars. 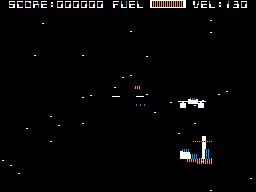 The goal is simple: Eliminate a given number of enemies before the fuel runs out to reach the next stage. Besides steering the ship one has also to control its speed, as the enemies tend to give it a wide berth and have to be chased most of the time. A hit doesn't mean instant death, but first only cracks the "windshield" as graphical feedback for the damage. 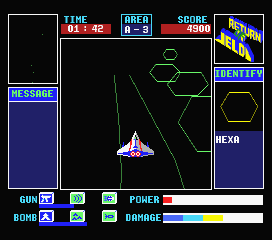 Localizations are usually not included with their own entries on this site, but Time Trek deserves a mention as the first heavily text-reliant game translated into Korean (not the first overall, there have been a number of simple title screen translations at least since 1984). 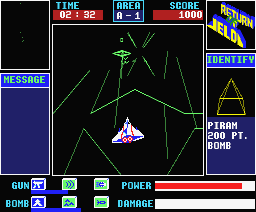 The adventure was an obscure title even in Japan by a company called Policy. 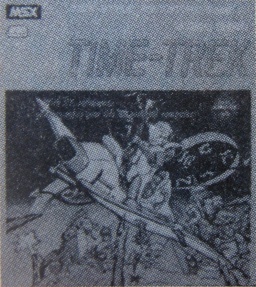 So obscure that it's hard to even find screenshots of the Japanese version, and also the Korean one is only known from very low quality black & white pages in Computer Hakseup. 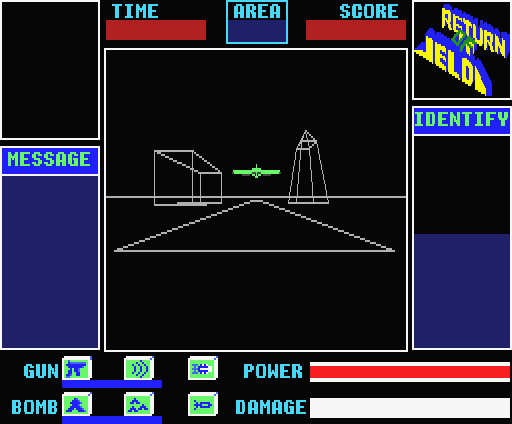 This game required a bit of detective's work to get any information on its origin. It was only released in Japan by Carry Laboratories, which is the only company credited in the code. 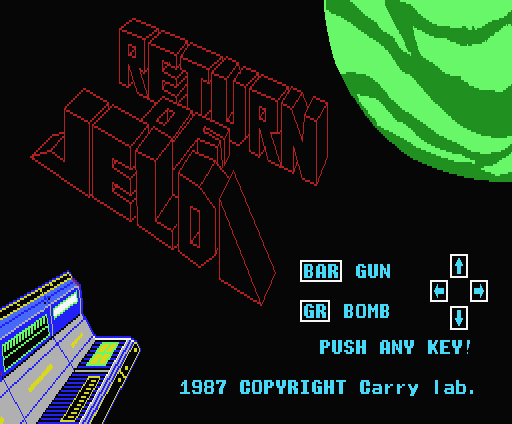 And nothing would have disturbed the image of Return of Jelda as a Carry game if it weren't for a tiny casual mention in the weekly business magazine The Econo File. Focused on SunA's first self developed arcade game, the article goes on name-dropping a few more active developers, including Softmen. The team is stated as having finished a contract with Carry to export a game "Jelda"1. Depending on what the jury's gonna say on Olion, however, this may have to be taken with a grain of salt as well. Like Olion, the shooter relies on 3D graphics, but they're more stilized and well-defined this time around. 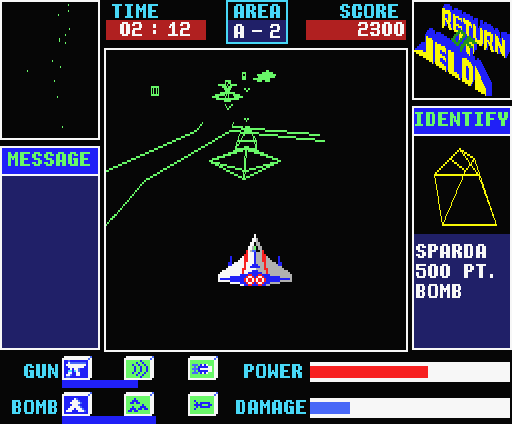 The actual gameplay takes place on two planes, though, with lasers to attack flying enemies and bombs for turrets and buildings on the ground. 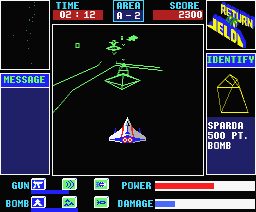 Both weapon systems have to cool down after excessive use, leaving the ship vulnerable to enemy attacks. But also time eats away on the life bar, so haste is mandatory. 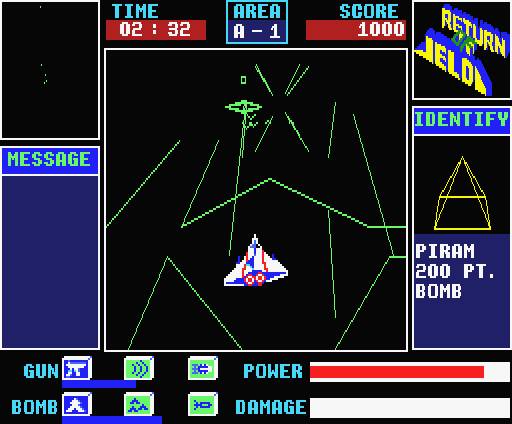 The player manages also the speed of the ship, which can even fly slowly backwards. 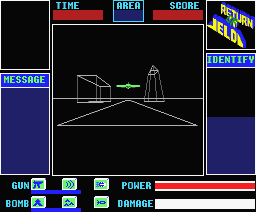 The game suffers a bit from its low framerate, and the simple wireframes are limited to a single color, but for a 3D game in its time, it once again impresses with its playability. Carry already published two games in the Jelda series for the PC88 in 1984, but it is highly improbable that Softmen had anything to do with those, if they even were really involved with the third one. 1. The Econo File 9/25/1987, page 137.